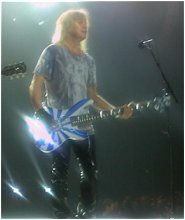 Def Leppard began their Down Under tour yesterday in Auckland, New Zealand and the first fan pics have been sent in. Many thanks to Jazrod who has submitted some pics from the show, the very first contributions from New Zealand. pitcher6685 has also shared some cool HD video footage - see Video page. The tour now moves on to Perth in Western Australia on the 15th. Whilst in town the band are due to feature on the Channel 7 Telethon.